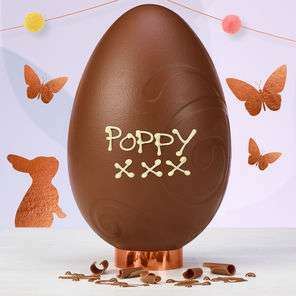 Add 5 PERSONALISED Easter Eggs in basket, add code EASTERDM and get it for £18 with free delivery! Great find with the code, that's Easter sorted! i know these are 250g but does anyone know the dimensions? Anyone know the size of this? Is the photo life size? Cloud15 gives 15% off so £17. Great dealCloud15 gives 15% off so £17. HI, I'm using the code and the eggs come down to £18 but then there's a £3.95 delivery charge. How do I get free delivery as well? ?